Material jetting is a relatively new 3D printing technique that uses liquid photopolymer and UV light. Learn all about this speedy technology, including how it works, its pros and cons, and its ideal application areas. Material Jetting, Simply Explained What Is It? Material jetting (MJ) is one of the fastest and most accurate 3D printing technologies. It builds parts using liquid photopolymer droplets, which are cured (made solid) with UV light. Because the photopolymer resin is sprayed in droplets before it’s solidified, MJ is often compared to the 2D inkjet process. However, while inkjet printers deposit only a single layer of ink droplets, MJ builds layer upon layer until the part is finished. MJ is also quite similar to SLA since it uses a UV light source to cure the resin. Here, the difference is that MJ 3D printers spray hundreds of tiny droplets at a time, while SLA 3D printers hold an entire vat of resin, which is selectively (point-wise) cured by a laser. Another aspect that makes MJ unique is how material is deposited (and therefore cured). Essentially, MJ printers jet resin from multiple print heads along an X-axis carrier, which sweeps back and forth across an evolving print. To help visualize the movement of the apparatus, think of the light source in a 2D scanner or the windshield wiper of a car. In contrast, the three most popular 3D printing technologies — FDM, SLA and SLS — deposit, cure, and sinter material in a pointwise fashion. For this reason, MJ is considered to be one of the fastest and most accurate 3D printing technologies. In the following sections, we’ll take a closer look at how MJ works, what are its pros and cons, and where it’s being applied. Material Jetting, Simply Explained How Does It Work? 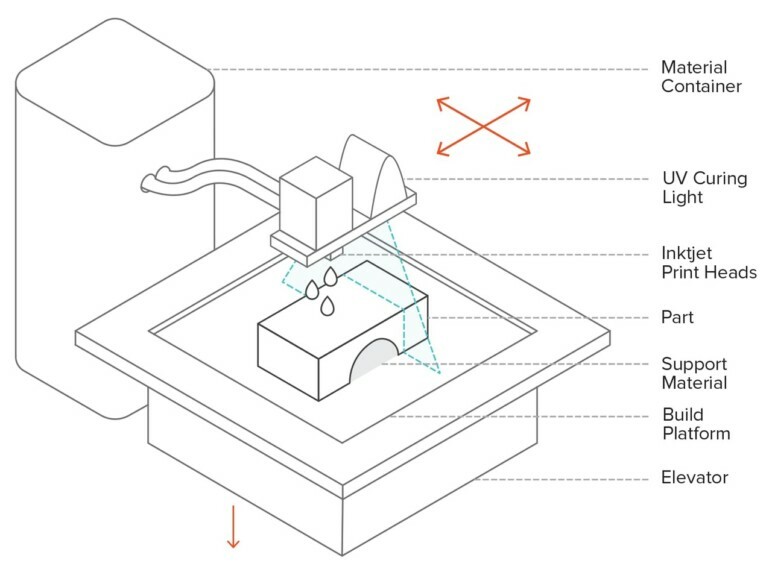 The main components of an MJ 3D printer are print heads, UV light sources, a build platform, and a material container. The print heads and the light sources are suspended along the same X-axis carriage. The printing process begins with pouring the resin into the material container. Just like SLA, MJ makes use of thermoset photopolymer resin, meaning it must heated (to between 30 and 60 °C) in order to reach the appropriate viscosity. As the X-axis carriage starts to travel across the build platform, the print heads begin selectively jetting hundreds of tiny resin droplets. Following the print heads are the UV light sources, which immediately cure the sprayed resin. After an entire layer is completed, the build platform drops one layer in height and the process is repeated until the part is complete. Apart from allowing material deposition to span the entire X-axis, the multiple print heads provide another benefit: multi-material printing. 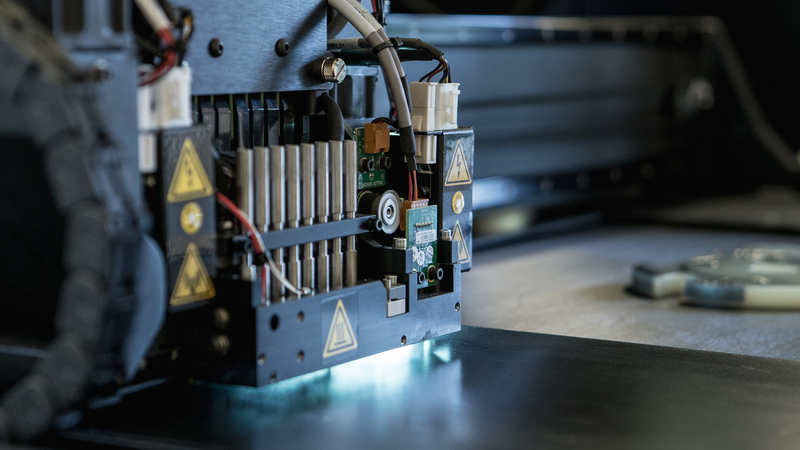 Similar to other multi-material 3D printers, this allows for dissolvable support material or multiple varieties or colors of functional material. There are plenty of materials available to choose from for MJ. 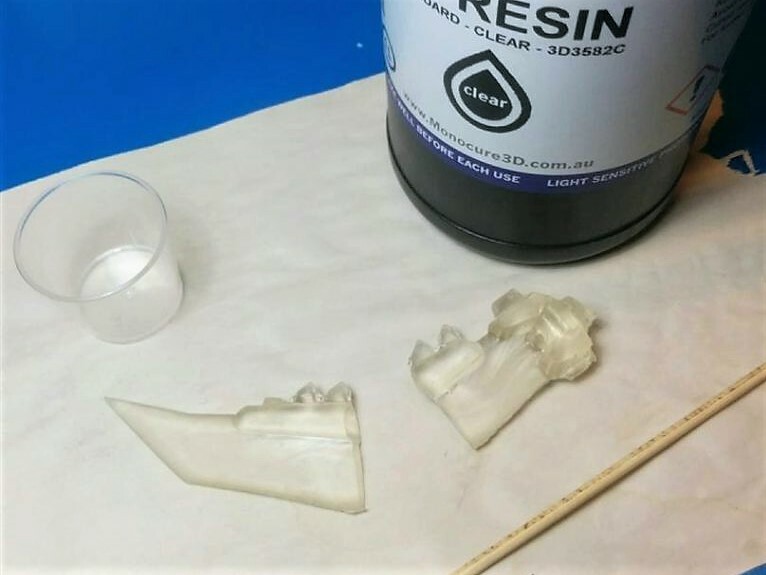 Standard resin is used for making prototypes and end-use parts, but there are also flexible, castable, transparent, and temperature-resistant materials. As with any other 3D printing technology, MJ 3D printing has its pros and cons. As mentioned above, build speed and dimensional accuracy are the two parameters that really make MJ stand out. Thanks to the technology’s nature, it’s possible to produce multiple parts without affecting the build speed, which is already fast even for a single part. This can be quite handy for shared or small-scale production. Parts made via MJ have a very smooth surface, which is ideal for making aesthetical prototypes. So much so that material jetted parts can be compared to injection-molded parts (in terms of looks). Full color and multi-material 3D printing is yet another amazing feature of MJ, further adding to the aesthetic quality of both prototypes and end-use parts. High-performance printing and an extremely smooth surface finish come with a high price tag. 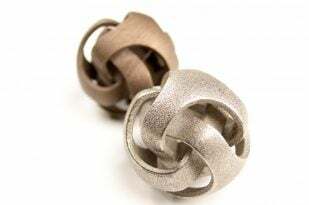 MJ is one of the most expensive 3D printing technologies. This is due to the costs of both the machines and the materials. Another limitation of MJ is the strength of the printed parts. MJ parts are structurally weak, meaning they’re not ideal for components that must handle some kind of load. In fact, MJ shares this very same limitation with SLA. Parts printed using either technology are fragile due to the nature of the resin. Finally, MJ is not without its waste material. As with FDM and SLA, MJ requires supports for parts with overhangs. Given the high cost of resins — even dissolvable support material — any amount of waste material is somewhat less than desirable. As you’ve probably guessed, MJ is primarily used for the production of beautiful, realistic-looking prototypes. 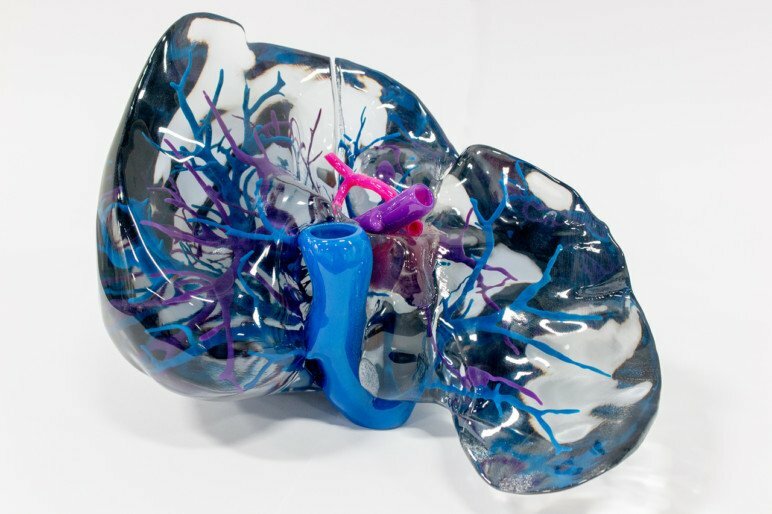 As an example, MJ might appeal to doctors and students in need of accurate models of body parts. Similarly, architects, designers, and artists can greatly benefit from the precision and aesthetic quality of material jetted models. MJ can also be used to make low run injection molds thanks to the great level of detail and the temperature stability of the material. 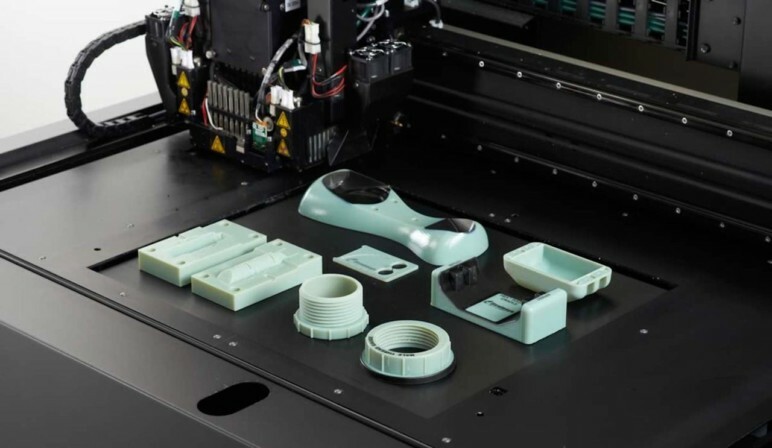 In any case, the cost of 3D printing parts using MJ limits the technology’s use in most cases to professional applications. Luckily, even if you can’t afford to buy an MJ printer, you can still get your designs printed in high detail resin using a 3D printing service. To find the best service for your needs, check out Craftcloud, All3DP’s 3D printing and price comparison service. We offer real-time prices from a wide variety of service providers, including Shapeways, i.Materialise, and Sculpteo. License: The text of "What Is Material Jetting? 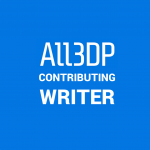 – 3D Printing Simply Explained" by All3DP is licensed under a Creative Commons Attribution 4.0 International License.